ePublishing Knowledge BaseePublishing Knowledge BaseePublishing Knowledge Base EditorialHow do I create a new edition or issue of a publication? This article will show you how to create a new edition, or issue, of a publication. If you'd like to create or edit a publication, read: How do I create or edit a publication? 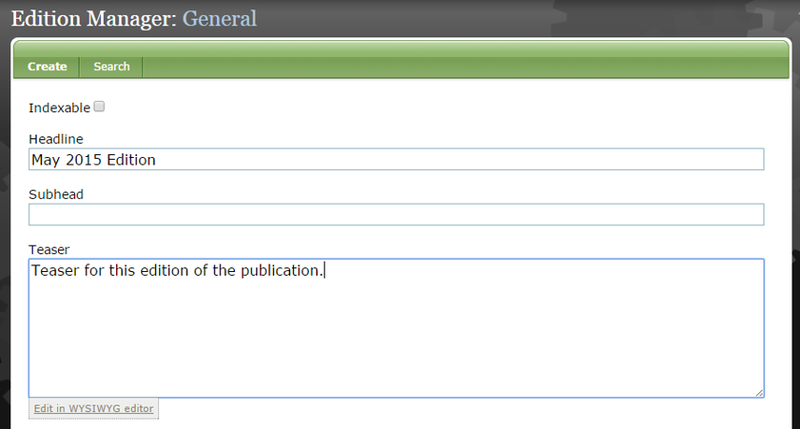 Select the publication you'd like to create an edition for from the dropdown at the top of the page. 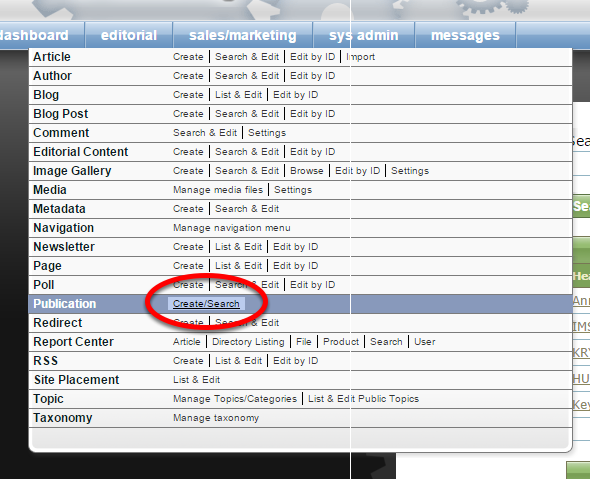 Zoom: Select the publication you'd like to create an edition for from the dropdown at the top of the page. Under Edit, click Create next to Edition. Name your new edition, and add a Teaser, which will appear on the landing page for this edition of the publication. Zoom: Name your new edition, and add a Teaser, which will appear on the landing page for this edition of the publication. Add a subhead if desired. 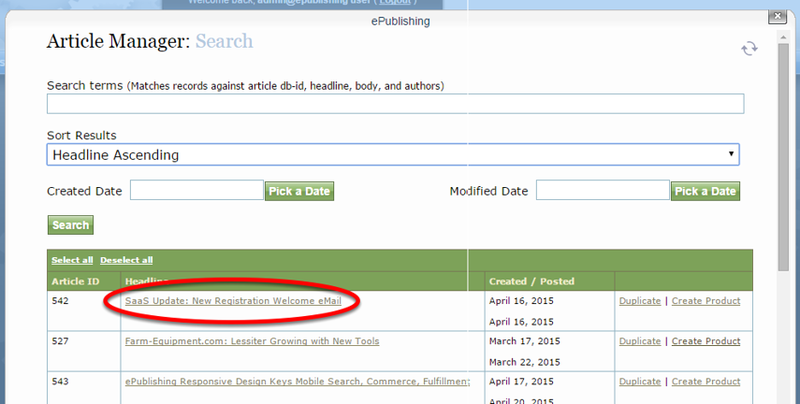 Your title will show in the dropdown menu of publication editions on your website. Many websites will use a date, but may also include the headline for the cover story. Set a Go Live Date and Time. Zoom: Set a Go Live Date and Time. The date and time represents when the publication edition will go live on your website. Set a Pull Date and Time if you'd like it to be unpublished at any time. Most of the time, the Pull Date and Time will remain open. Set a Publication Date, which drives which order your editions appear on your publication's landing page. Click on Browse to select an image to associate with this edition. Most websites use the cover image. Zoom: Click on Browse to select an image to associate with this edition. Most websites use the cover image. For example, this is where the image will appear on your edition's landing page. Assign Site Placement and Topic/Category if relevant for your website. Zoom: Assign Site Placement and Topic/Category if relevant for your website. 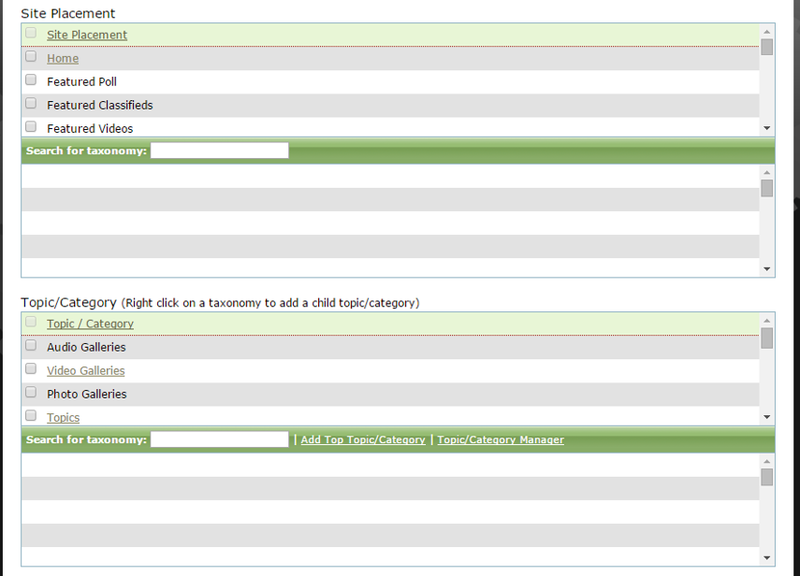 Taxonomy can be specific to a website, so please contact your solutions manager if you have questions. Add a Volume and Edition number and click Create. 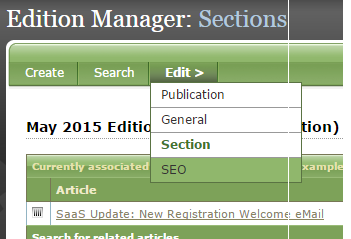 To assign articles to this edition of your publication, click Section under Edit. 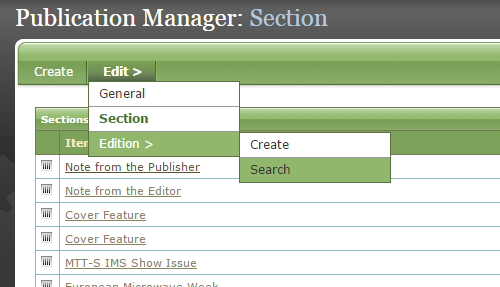 Each section set up when you created your publication will appear on this page. 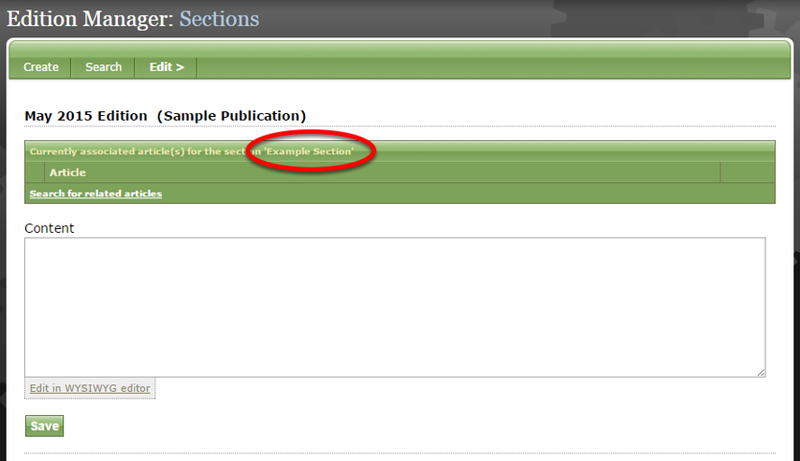 Zoom: Each section set up when you created your publication will appear on this page. Click Search for related articles to associate an article with a section. To search for an article, input the search terms and sort results by clicking on the dropdown. Zoom: To search for an article, input the search terms and sort results by clicking on the dropdown. To select an article, click on its headline. Zoom: To select an article, click on its headline. When it has been successfully added to your edition, a yellow Success bar will appear and your article headline will exist in the correct section. Zoom: When it has been successfully added to your edition, a yellow Success bar will appear and your article headline will exist in the correct section. 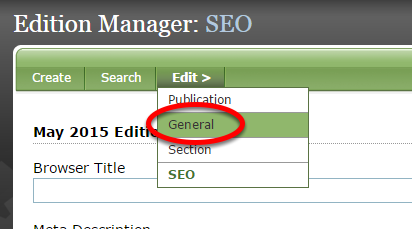 Click Save when you are finished adding content to your edition, and click on SEO under Edit. Edit SEO for this edition, including adding a SEO-friendly Browser Title, Meta Description and Keywords. 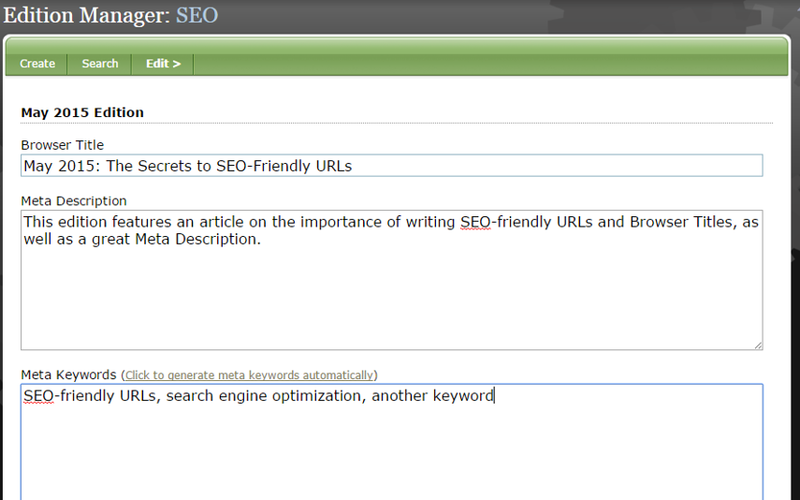 Zoom: Edit SEO for this edition, including adding a SEO-friendly Browser Title, Meta Description and Keywords. Don't just use the date as the Browser Title. Click Save and return to the first page of your edition. Prev: How do I create or edit a publication? 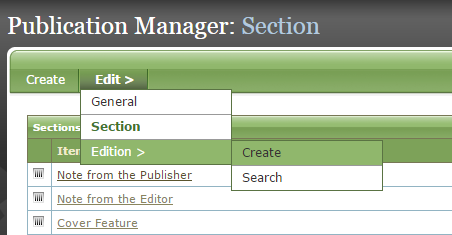 Next: How do I set the order of articles and other content associated with a specific taxonomy association using the Site Placement Manager?